Phil Gould didn't mince words on Anthony Griffin. 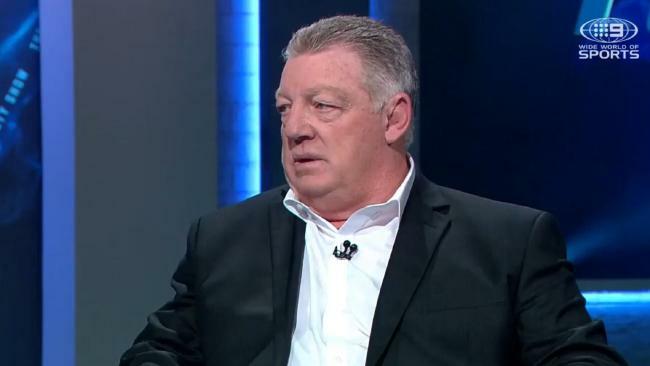 PANTHERS boss Phil Gould has returned serve to sacked Penrith coach Anthony Griffin after the 51-year-old swiped at the club in an explosive interview on Wednesday. Griffin was sacked after a swathe of disagreements and blow-ups with Gould ended in the latter pulling the pin on his contract late in the season. Gould said Griffin's "old school" coaching style didn't reflect the path he wanted the Panthers to follow on their mission to break their 15-year premiership drought. 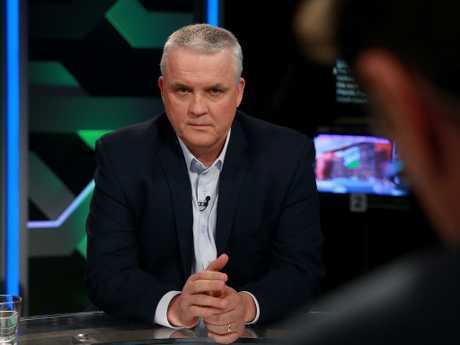 Griffin opened up on FOX League's NRL 360, slamming Gould's management and the allegedly poor state of the club out of which he helped build them. Gould said his former head coach "embarrassed himself" in the sensational tell-all. "My first thoughts were he shouldn't have done it. I don't think he's done himself any favours," Gould said. "He's hurt a lot of people in that interview. "He was ill-advised to do it. He should have taken deep breaths. The last thing I said on Monday to him was 'take this money and take a holiday, take a rest'." Gould said it was important he defended his club's work over the past seven years after Griffin claimed it was a mess when he arrived in late 2015. "I will defend our club. Where the Panthers sit today is a product of the expertise of many, many people who have been loyal, hardworking and who have gone beyond the norm to produce the results we've got," Gould said. "To try and take credit for all of that or to say it was a shambles before he arrived is highly disrespectful and just totally wrong." Sacked Penrith coach Anthony Griffin said he built the club out of a hole. The under-fire Panthers boss said the club supported and "protected" Griffin throughout his three years at Penrith. "They wouldn't have won a premiership the way they were being coached. He's got us nowhere near at the moment," Gould continued. One of Griffin's major concerns with the club's boss was his handling and involvement in recruiting lasting juniors for first grade. Gould chuckled off the comments as "disrespectful in the highest". "He's saying I was sitting on my arse for seven years and doing nothing out at Penrith. That's his problem. He shouldn't have rushed into this interview, he should have responded after he cooled down and thought his words out carefully," he said. "He's not the easiest bloke to talk to at the best of times - particularly if you have to debate him - but I think he rushed into that interview." Gould sensationally revealed interim coach Cameron Ciraldo handed in his resignation twice under Griffin's rule as coach but was talked back into staying at the club. "He was a wonderful ally to Anthony Griffin. He assisted that man loyally without question. "He came to me and resigned twice because of the way he was treated by the head coach and twice I talked him into staying so there's two sides to this story." Gould refused to go into details surrounding Ciraldo's gripes with Griffin. Panthers great Mark Geyer shut down Griffin's suggestion that part of the reason Gould sacked him was because he was worried Penrith would win the premiership this year under his leadership. Griffin took aim at Gould as he rejected several claims made by the Panthers supremo in the wake of his axing this week. Gould said Griffin didn't consult his assistant coaches enough and had lost the support of the players. Griffin denied those accusations, saying instead he was shown the door because he and Gould held completely different coaching philosophies and the former NSW mentor didn't want the side to be coached in the style Griffin wanted. Griffin hinted he may have been sacked partly because if the Panthers - sitting equal fifth on the ladder - won the grand final, it would be much harder for Gould to justify getting rid of him. "The timing is cruel … they are on the verge of winning a premiership this year, which is probably one of the reasons I'm not there," Griffin said. Geyer said Griffin's claim Gould didn't want to win a premiership was ridiculous. "I can't agree with that. Every year that Penrith get further away from winning the comp, it makes Gus's five-year plan look pretty ordinary, doesn't it?" Geyer said on Triple M. "Gus wants to win the comp as much as anybody." Geyer said the Panthers couldn't have won the competition with Griffin still in charge this year, pointing to the team's defensive frailties as the main reason it can't compete with the likes of Melbourne and Souths. "Defence is an attitude. If you really want to get stuck in and do something for your coach, you bash teams," Geyer said. "At the moment I don't see the team doing that for Anthony Griffin." Breaking UPDATE: A woman has died in a low-speed two-vehicle crash on James St early this morning.